Improving furniture stability by strengthening standards, making those standards mandatory and enforceable and promoting changes in furniture design. Two-year-olds are the age group most affected by tip-overs, especially in regard to fatal incidents. Children age 2 to 5 accounted for 77% of total incidents. The age range of children injured is wider than the age range of children killed by tip-overs. Fatalities accounted for 12% of total incidents. Head injuries (37%) were the most common category of injury. Almost all (98.7%) of head injuries are related to a television tipping over on a child. KID conducted performance tests on a sample of 19 dressers and chests. Testing was run at the UL Furniture Center of Excellence in Holland, Michigan. UL laboratory technicians followed a testing protocol developed by KID. 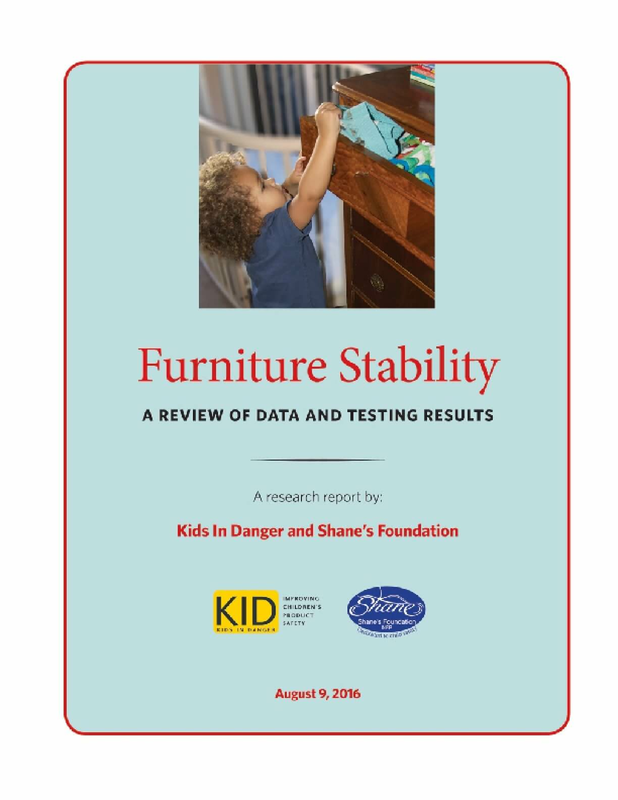 The protocol included tests based on the current voluntary standard for furniture stability. KID added tests that, among other things, evaluated for tip-overs when more weight was added (simulating larger children), drawers were full of clothes, furniture was placed on carpeting as opposed to bare flooring, televisions were placed on top of the furniture, and additional drawers were opened simultaneous with weighting one drawer. These additional tests were intended to be more representative of real-world scenarios. Only nine of the 19 units passed performance tests based on the current tip-over safety standard, ASTM F2057. Only two units passed all tests, including the additional testing protocols added by KID. The weight of a television or any type placed on top of the unit did not decrease the stability of furniture. Furniture placed on carpet is less stable than furniture placed on hard floors. Many units remained stable when more than 70 pounds was placed on an open drawer, while others tipped with less than half that weight. Copyright 2016 by Kids In Danger. All rights reserved.